Much could be written—much has already been said around these parts—about the San Francisco Port Commission’s special meeting today, which unanimously approved two different visions of how the city’s waterfront could be configured to host an America’s Cup match. With that, the Commission enabled negotiators to continue to move toward a something-that-works-for-everyone solution. Much could be written, yes, but Commissioner Ann Lazarus summed up most of the public comment in her wrapup statement, “Seize the moment.” The public comment was overwhelmingly supportive. Negativity was focused on two points that I believe will go away. My takeaway: There’s been a huge shift on the part of the team and the Event Authority, from saying a flat no to any consideration of using facilities on the northern waterfront to seriously entertaining what is now known as the Northern Waterfront Alternative. The first thing the Alternative does is leave Pier 50 as-is, removing the expense and disruption of overhauling it and displacing a significant body of maritime industry tenants holding long-term leases. That eliminates negativity point number one. 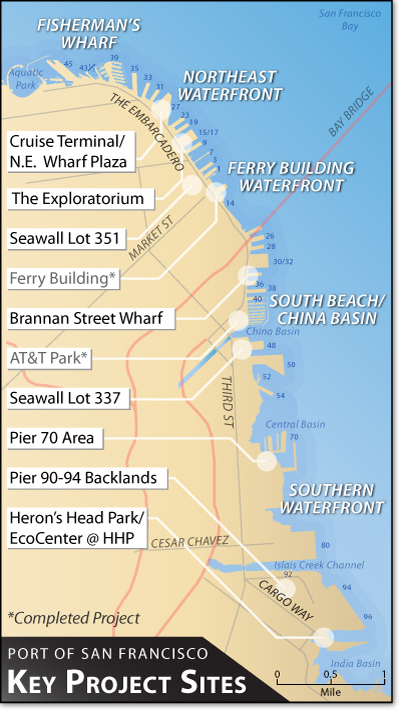 The original Host City Agreement (HCA) called for putting the bases at Pier 50, with most public-interaction taking place at Piers 30-32, closer to the Bay Bridge. Under the Alternative, the bases go to the functionally-abandoned Piers 30-32 (to be overhauled with developer money) and public interaction moves north of the Bay Bridge, to Piers 19, 23 and 27—where most of the tenants are short term—with special focus on Pier 27. There’s even talk of putting a start line near Pier 27, almost in the shadows of the downtown high rises, right below Telegraph Hill/Coit Tower, to maximize public viewing. And the Northern Waterfront Alternative received support from the dwellers of Telegraph Hill, which is no small matter. Pier 27, for a time, has been eyed as a future cruise ship terminal, and the new scheme envisions commingling America’s Cup development with long-range cruise ship facility development. Perhaps it even hastens the completion of the shell of what eventually becomes a cruise ship terminal. Not a done deal, any of this, but a telling sign of how active and how fluid these negotiations really are—the best sign I know that we’re going to get there, we’re going to get there . . . no, the torture’s not over . . . But with savings quickly adding up to the tens of millions of warbucks, the Northern Waterfront Alternative would seem to have momentum at the moment. And it’s walking distance from Pier 39. The other point of the HCA drawing negative comment is an intent to waive the Jones Act for the crews of raceboats and visiting spectator yachts. The Jones Act protects US interests in US maritime commerce, and the unions object. Kyri McClellan, AC project manager for the office of Mayor Gavin Newsom, said, “We are committed to working with the unions to make sure the language reflects the intent, that waivers apply only to raceboats and visiting yachts (allowing the yachts to be chartered, a huge attractive force). Sure, it’s a laugh line . . .
An important footnote: This is my best, hasty shot at an account of today’s special meeting of the San Francisco Port Commission. I believe it accurately reflects the state of play, as far as it goes. The next piece of public business will be a December 8 hearing before the Budget and Finance Committee of the Board of Supervisors. When we move from the Ferry Building to City Hall, the game becomes far more political and divisive. My advice: Follow the money. Your relevant reading, including the Northern Waterfront Alternative, can be found at the Port of San Francisco web site, on this page.